Quinoa, although often called a whole grain, is actually the seed of a green leafy plant that is still cultivated in South America. Quinoa is considered an ancient grain, and can be used in everything from porridge to salads. Since quinoa is a complete protein and has all 9 essential essential amino acids, it is a great option for vegetarian diets. I love using grains such as farro, barley, or quinoa as the base for nutritious and delicious lunch salads and all three of these grains can be substituted for each other. This is another easy salad that I like to make to take on picnics, or keep a big bowl in the refrigerator for quick lunches. You can play around with the vegetables, replacing my choices with any you prefer. I always like to add texture to my salads so I always add a crunchy vegetable or two, and I also like my salads to be visually appealing so I usually add in some fresh green herbs or chopped greens. This salad has an earthy feel to it with the roasted cauliflower, chickpeas, toasted hazelnuts, and sautéed mushrooms, so I decided to dress the salad with a light balsamic vinaigrette which worked really well. To cook the quinoa, place in a pot and cover with salted water by two inches. Bring to a boil, then reduce the heat and simmer the quinoa until cooked. Drain, and cool. To toast the hazelnuts, place in a 375 degree preheated oven for 5 to 7 minutes or until just beginning to brown. Remove from the oven and rub with a kitchen towel to remove at least half the skins. Quinoa is a complete protein, and has all 9 essential amino acids, making it a great option for a vegetarian diet. Quinoa is also very high in manganese, fiber and contains niacin. An earthy, grain based salad that is a complete meal in a bowl. Preheat oven to 375 degrees F. Place the cauliflower on a baking sheet, and toss with two teaspoons of the olive oil, salt and pepper. Bake the cauliflower until golden brown and tender, about 15 minutes. Remove the cauliflower to a bowl and set aside. Drain and rinse the Garbanzo beans, and pat dry. Toss the beans with two teaspoons of the olive oil, salt and pepper, and place on a baking sheet and roast for about 15 minutes or until the beans are beginning to brown. In a frying pan, heat the last of the olive oil, and cook the mushrooms until tender, or lightly browned. Add the garlic, and cook until fragrant, then set the mushroom and garlic mixture aside to cool. 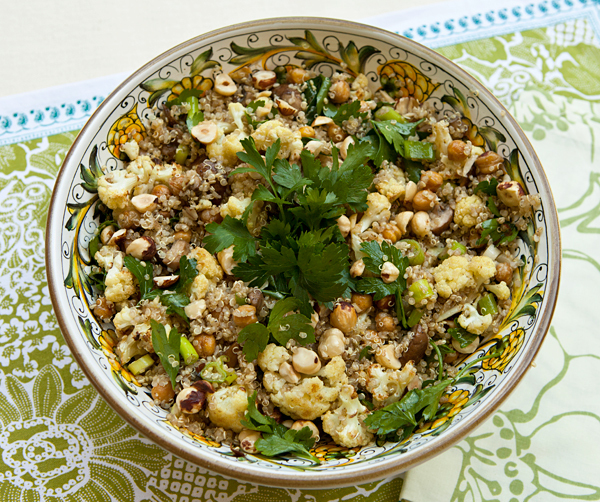 In a large bowl, toss together the quinoa, cauliflower, garbanzo beans, mushrooms, parsley, and green onions. In a small bowl, whisk together the vinegar, oil, salt and pepper. Toss the dressing with the salad ingredients to mix well. 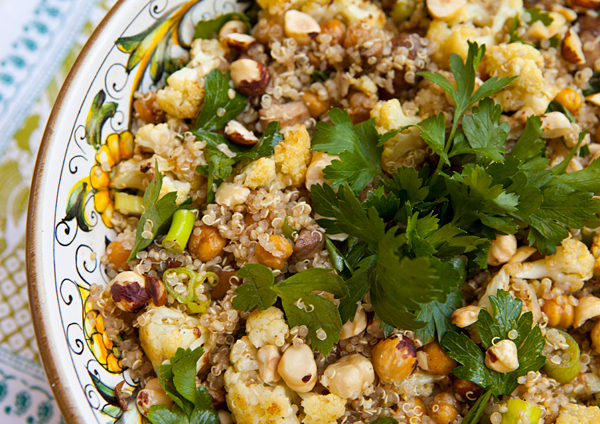 Top the salad with the hazelnuts and serve.